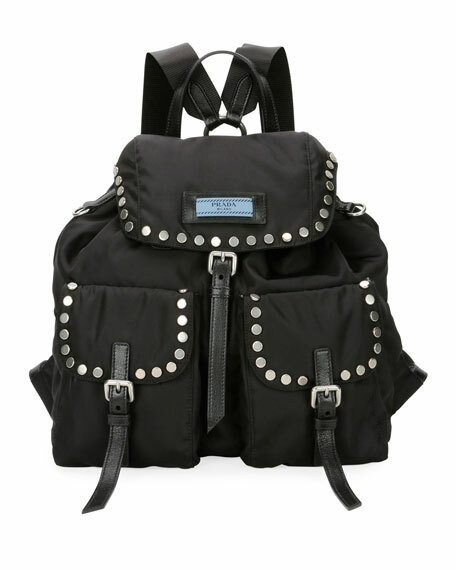 Prada nylon backpack with studded edges and calf leather detail. 12.6"H x 11.8"W x 6"D.
Prada was founded in 1913 in Milan by Mario Prada and was originally known as Prada Brothers. In 1978, Mario's granddaughter Miuccia Prada led the company's expansion into distinctive clothing that quickly became a favorite among celebrities worldwide. Currently, Prada is one of the most influential clothing lines in the fashion industry, with an iconic collection that includes sunglasses, handbags, and shoes in addition to men's and women's clothing. For in-store inquiries, use sku #2631455. This item is not available. Exclusively ours. 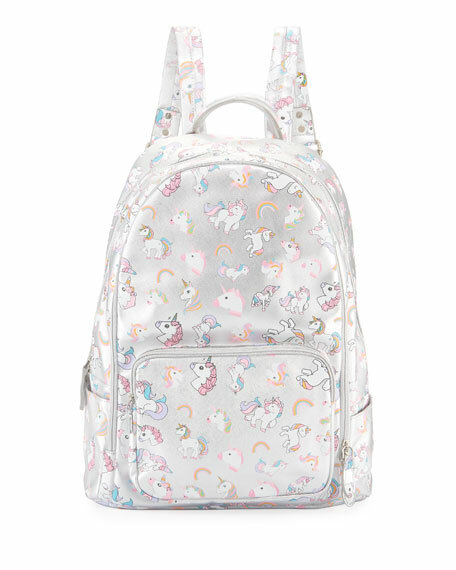 Bari Lynn metallic faux leather (polyurethane) backpack in allover mixed unicorn print. Rolled top handle. Adjustable shoulder straps. Two large compartments with two-way zip closures. Front zip pocket. Side slip pockets. Imported. 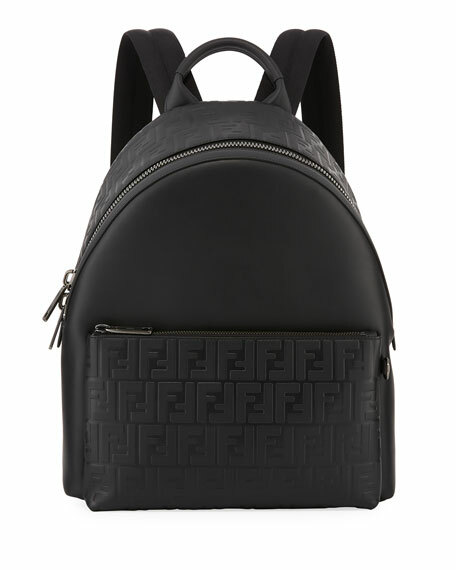 Nylon backpack with leather trim. 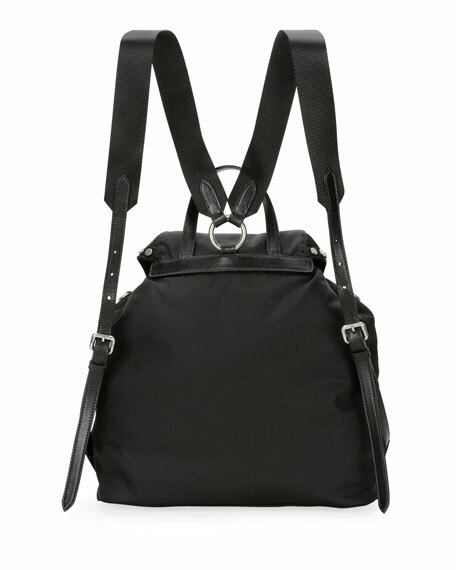 Rolled top handle; adjustable shoulder straps. Two two-way zip around compartments. Front exterior zip pocket. Interior, laptop compartment; zip and slip pockets. 13.5"W x 7"D x 17.5"T. Polyester lining. Imported. 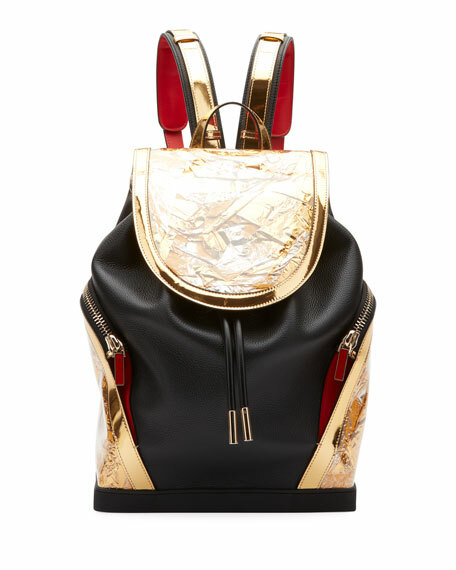 Christian Louboutin colorblock leather backpack with see-through PVC and golden aluminum foil detail. Flap top conceals drawstring closure. Shoulder straps with signature red lining. Flat top handle. Side zip pockets. Inside, cotton lining. "Explorafunk" is made in Italy. HOW MAY WE HELP YOU?